In 2005 a small group of women met for three days to pray and seek God’s will for a conference that would call women to live wholly for Jesus. The Come to the Fire conferences call women to come and receive His fiery cleansing so they can dwell in Him who is a consuming fire. His fiery cleansing destroys pride, selfish ambition, self-centeredness—all that is destructive to His holy life within us. But the conferences are not just about a one-time coming into His presence. Fire is His very essence. We who say we abide in Him who is a consuming fire must be ready to dwell continually in that Fire so He is free to reveal anything that hinders His holiness being seen in us. Our great longing and prayer have become, “Will You do something for Your Church to restore the fame of Your name? Will You do all that You desire so You’ll be glorified in all the earth.” We believe that a new day is on the horizon for Christ’s Church. The first three conferences were in the Kansas City area. Then the conference moved to Nashville in 2009. Below is a brief report of the 2010 Come to the Fire. The beautiful Auer Performance Hall on the Indiana-Purdue University Fort Wayne (IPFW) campus in Fort Wayne, Indiana, was the location for the 2010 Come to the Fire women's conference. More than 1,500 women representing 32 states, numerous nations, and varied cultures attended this event focused on the holy heart. Women came from 44 denominations, including the Church of the Nazarene, Anglican, Catholic, Mennonite, Vineyard, Wesleyan, Bible Holiness, Methodist, and Baptist traditions, numerous nondenominational groups and house churches. Months before the conference, Lydia prayer groups led by Patsy Lewis began earnestly praying for this conference. Over 100 people E-mailed asking for lists of attendees for whom they could intercede. Numerous individuals fasted and prayed. Women testified that when they entered the auditorium they walked into God's presence. The place was filled with joy, unity, God's love, grace, forgiveness, and healing. The speakers represented several denominations. In the past, keynote speaker Beth Coppedge, a Methodist, challenged the women to have "squeaky clean" hearts. This year, Coppedge spoke of the amazing privilege of having a "face to face" relationship with Jesus. Jo Anne Lyon, a general superintendent in The Wesleyan Church, didn't waste a word challenging the women to let God use them through her message "Holy through You." Janine Metcalf, pastor of the El Cajon Church of the Nazarene, urged women to have a "Burning, Yearning Heart." In the healing service, led by Carolyn Johnson of Firm Foundation Ministries, women came to be healed spiritually, emotionally, and physically. They streamed forward to be anointed and Jesus healed. In the first few days after the conference, over 400 women wrote many of them expressing how Jesus had met them. They sent reports of the next day's church services turning into altar services after women testified of what God did for them at Come to the Fire. One participant wrote, "Our pastor's wife asked us to fast and pray for the conference in the weeks leading up to last weekend. At the conference, I listened to the speakers, challenged by their words. I loved the worship and fellowship with women from my church. But I didn't hear Him or connect with Him as I had hoped. "I quickly got up before I had a chance to change my mind and knelt behind the musicians, tearfully praying as I surrendered myself to Him, putting aside my pride, and placing Him first in my life. As I prayed, a woman asked if she could pray for me. I told her my name and why I was praying. She prayed for me, and encouraged me to pray aloud, too. After I had finished, she asked me what my last name was. When she heard my last name, she said, 'You have been on my prayer list that I've prayed for by name for the last two weeks.' I was floored. "I know that those things happen, but I had never experienced that myself. I had always believed that those divine appointments happened to other people, but that God didn't do that for me. God touched me in a new way and reminded me that He sees and loves me." Praise God from whom all blessings flow! Women came to the Fire and now go to spread His Fire - to “Reflect His Glory” - the theme of the 5th annual Come to the Fire conference. I believe Come to the Fire was in God's heart long ago. "Long ago I ordained it. In days of old I planned it; now I have brought it to pass" (Isaiah 36:26). When I went by Borders bookstore and saw it was closing, I thought I would like to go there one more time and stand in the spot where God spoke to me in 1994. God's words letting me know that some day I would be involved with large conferences came to me with great joy. Later a friend told me of her desire for a deeper life conference. In 2004, we emailed back and forth our ideas and our dreams. The next day she emailed: "Today in the laundry room God told me I've done my part, and that the ball is in your court." Suddenly I knew I must move ahead. But how? Years earlier, a lady I did not know gave me a verse that she declared was mine. It was from Joshua 3: "When you see the ark of the covenant of the LORD your God, and the priests, who are Levites, carrying it, you are to move out from your positions and follow it. Then you will know which way to go, since you have never been this way before." The ark held the presence of God, and it would be His Spirit that we would follow. I called a group of women together to begin praying and planning. Some of us had already been praying, because in 2002, Beth Coppedge had asked several to join her for a prayer retreat. That retreat was such a blessing that we continued to meet every six months. So nine of us met in January 2005 around my dining room table. We prayed and talked. The night before we met, I had told Pastor J.K. Warrick about this vision and he immediately invited us to have the first conference in College Church of the Nazarene in Olathe, Kansas. One day before the first conference, I was sitting at the kitchen table with my Bible open to our theme verse in Deuteronomy 5:4: "The Lord spoke to you face to face out of the fire on the mountain." The words Come to the Fire came to my mind with the thought, That's the name of the conference. During one of the early council meetings Beth mentioned our need for consistent prayer and the need to call other women to invest in prayer. God had already put into her heart the idea of Lydia prayer groups. There are now Lydia prayer groups across the nation and around the world. For information about the Lydia ministry, visit www.tituswomensministry.org. One of our concerns was how to get people to attend. Then the Lord led us to Psalm 50:1: "The Mighty One, God, the LORD, speaks and summons the earth from the rising of the sun to the place where it sets." We began to pray, "Lord, summon the women." Women emailed that they felt drawn to this conference. 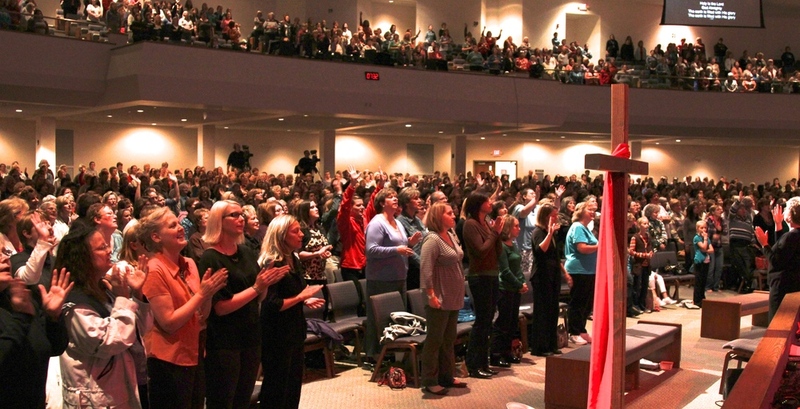 Over 1000 women from 35 states registered for the first conference, and we knew that God had summoned them. We had decided to charge $50 a person. At the second council meeting, one of the members said, "Paul didn't charge for his ministry." Another mentioned that we wanted this to be more like a revival than a normal conference and revivals do not charge. A few believed charging was necessary. Suddenly it seemed the Spirit filled me with the knowledge that we were not to charge. I knew He was giving us the privilege of trusting Him to provide necessary finances. He has been faithful! As we prepare for the ninth Come to the Fire, we continue to long for God to fulfill His promise in Ezekiel: "When I reveal my holiness through you before their very eyes, says the Sovereign Lord, then the nations will know that I am the Lord" (Ezekiel 36:23 NLT). May God prepare a people through whom He can show His holiness to the world. What God plans for the future we do not know. But we remember our verse in Joshua and we seek earnestly to follow the Ark. "Now to him who is able to do immeasurably more than all we ask or imagine, according to his power that is at work within us, to him be glory in the church and in Christ Jesus throughout all generations, for every and ever! Amen" (Ephesians 3:20-21). Aletha Hinthorn is Director of Women Alive Ministries and Come to the Fire conferences and emails daily devotionals. She has written many books including How To Read the Bible so It Changes Your Life.